Need a quick starch with dinner? 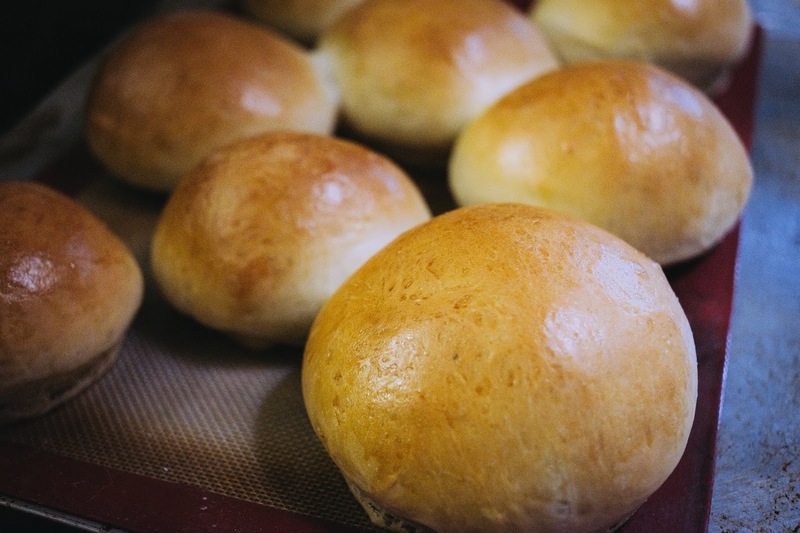 These rustic rolls are perfect alongside a roast, buttered and garliced like pandesal, or served with soft cheeses and jams. These will be a hit at your dinner table! In bowl of stand mixer, dissolve honey in warm water and add yeast. Stir, allow to bloom 15 minutes. Add oil, salt, and eggs, using dough hook to incorporate. Add all flour. Mix 3 minutes or until a smooth dough forms, stopping to scrape sides as necessary. Using a bench scraper, cut into 12pcs. Half, then in half, then in thirds. Begin preheating oven to 450F. Place on a rimmed baking tray and cover with a moist or flowered towel. Allow to rise in a warm place 15-30 minutes or until doubled in size. Bake 10 minutes until golden brown and internal temperature reaches 200F. Note: For a crispier more rustic crust, use a clean spray bottle and mist the rolls before baking. Additionally, heavily mist the inside of the oven before and during baking.